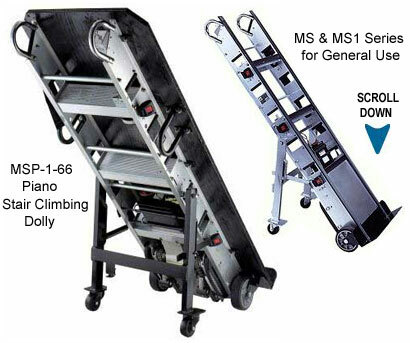 All Purpose Automatic Stair Climbing Dolly. (Please note: - The big wheel attachment is not available with the MSP-1-66, it is not compatible with this model). Made in the USA - Powered Hand Truck Dollies to move Pianos & Organs, heavy appliances, furnaces, bathtubs, water heaters, vending machines, furniture, business machines, air-conditioners, construction supplies, bottled gasses. Excellent for buildings with no freight elevator. Loads that would normally require two or more people, now can be accomplished by one person. ** Single control, easy to operate "UP-DOWN" switch. 30 Amp military rating. ** Frame made of tough aluminum alloy makes the dolly stronger than magnesium and lighter than steel. ** Scientific placement of multiple hand-holds give you a place to lift where you need it. ** Nickel-chromed steel comfort contoured handles, angled for easier load breaking and handling. ** Extraordinary gear box is built for years of service. ** "No Mar" lifting feet grip stair edge to Raise or Lower loads. Vertical application of thrust allows unit to be used on wet, carpeted or highly waxed surfaces. Big 10" x 4" inch pneumatic, ball bearing wheels allow you to roll heavy loads across lawns and rough terrain easily and smoothly. Snaps On-Off in 1 second. PLEASE NOTE:The following Toeplate attachments are for use with the MS series dollies only. Concave brace stabilizes water-heater, barrels and drums. If for any reason within the first 30 days of your purchase you are dissatisfied with your product, you can return it for a prompt exchange or refund of the entire purchase price with no restocking fee - so long as the unit is returned in new condition. The Stair Climbing dolly is warranted by the manufacturer when lubricated and operated as recommended-to be free from defect in material and workmanship, for a period of one year after delivery. All warranty items are to be returned with a Piano Showcase 'Return Authorization Number', freight prepaid, for inspection. If the item is determined to be defective, the unit will be repaired or replaced by the manufacturer. Alterations and/or careless or improper usage void this warranty. A nominal charge will be made for repair of units which are not operable for reasons other than defects in workmanship or material. Great value and quick shipping!! Can't beat that! !